The aim of the article is to indicate the most crucial aspects of cyber risk in the financial institutions as well as the problems connected with cyber security system and relationship with a customer. 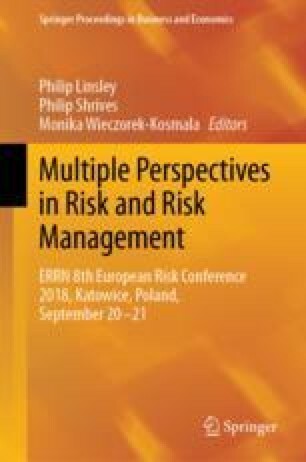 The article reviews the state of the cyber risk as a potentially one of the most dangerous ways of reputation damaging of a firm as well as a financial loss. Every firm must understand the constantly evolving risk and, moreover, the tools and all techniques to protect their systems. There is no difference between small and big companies in terms of risk. Moreover, not only financial services companies may be in danger. The cyber risk management may be seen as a way for a company to distinguish from its competitors which may build a long-lasting relationship between a client and a company. Security in a cyberspace is one of the most important issues for IT departments but not only. Nowadays, it is very popular to organise the large-scale hacker attacks. The reason of organising such attacks is generally the desire of getting the profit and ransom for the recovery of the data or control over the company’s computers. The attacks may be organised by both; a hacker or employees. Most of the criminals target financial companies because they strongly believe that it is the most profitable. Online and offline fraud incidents have also raised during the last few years. It resulted in monetary and also reputational losses for all the victims—financial institutions. Improving defenses require implementations of new products or systems and people. If a client is aware of the fact that the financial institution is very committed to prevent a fraud or cyber-attack, a good relationship with a customer may be established, as well as the good reputation of a company.